The Council of Canadians Guelph chapter and water campaigner Emma Lui took part in a protest against water shutoffs in Detroit. 31 chapters take part in 'Stop the KM buyout' actions! 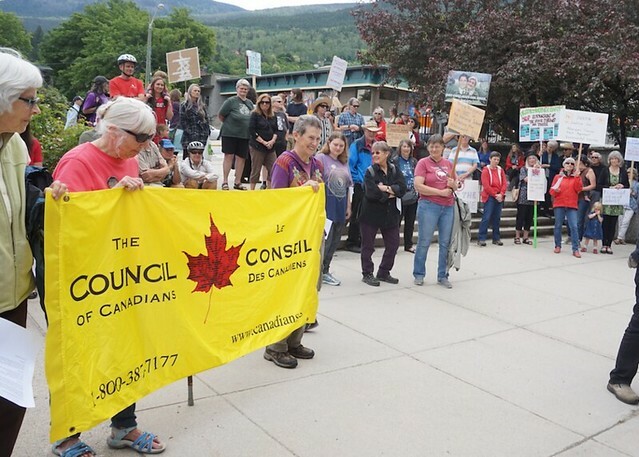 Thirty-one Council of Canadians chapters took part in actions across the country today in opposition to the Trudeau government's plan to spend billions of dollars to buy and expand the Kinder Morgan Trans Mountain pipeline. Read more about 31 chapters take part in 'Stop the KM buyout' actions! 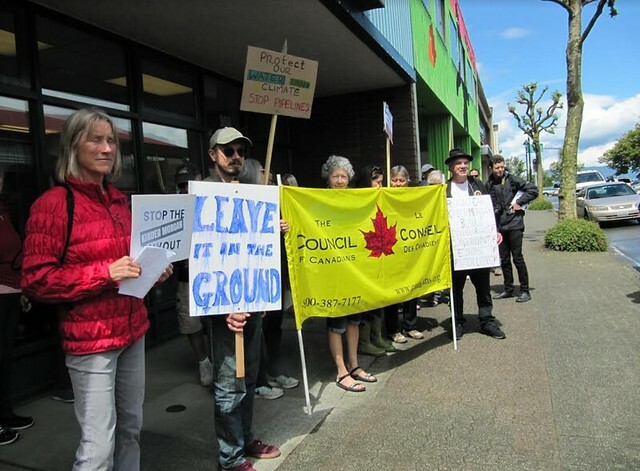 The Cowichan Valley, Victoria and Mid-Island chapters took part in a massive Stop Kinder Morgan protest in Victoria on May 31. 22 chapters to say #StoptheKMbuyout at rallies tomorrow! Twenty-two Council of Canadians chapters will be mobilizing across the country tomorrow (Monday June 4) with the demand #StoptheKMbuyout! For a complete listing of the 80+ rallies, please click here. Read more about 22 chapters to say #StoptheKMbuyout at rallies tomorrow! Twenty-one Council of Canadians chapters have now signed up to take part in the #StoptheKMbuyout day of action on Monday June 4. The Council of Canadians Mid-Island, Ottawa, Fredericton, Kent County, Powell River, Comox Valley, Saskatoon, Nelson, London, Montreal, Chilliwack, Prince Albert, Campbell River, South Niagara, Guelph, Inverness County, Peterborough-Kawarthas, Regina, PEI, Saint John and South Shore chapters will take part in rallies on Monday to express opposition to the Trudeau government's multi-billion-dollar purchase of the Kinder Morgan Trans Mountain pipeline and tanker project. The Council of Canadians is working with Leadnow, 350, Sierra Club, The Leap and other allies on this day of action. Leo Cheverie and Anna Kennan say goodbye to the P.E.I. Coalition for Proportional Representation and hello to the P.E.I. Proportional Representation Network in this video. To find out how to get involved in the new PR Network, please click here. The Council of Canadians P.E.I. chapter is a member of the P.E.I. 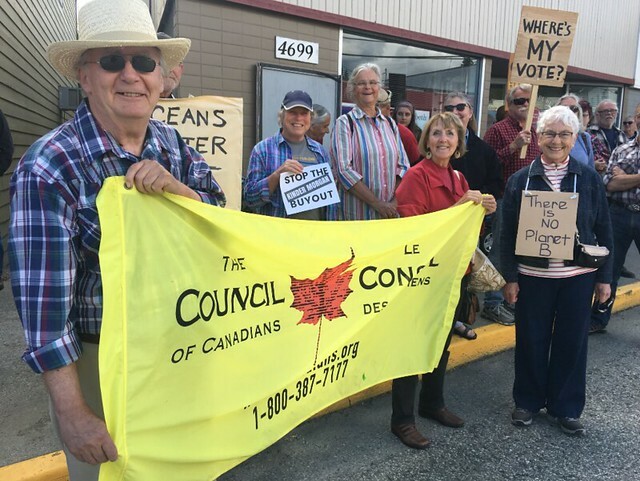 Coalition for Proportional Representation which had been planning to organize around a referendum on proportional representation that will take place at the same time as the next provincial election, which is scheduled for October 7, 2019. Four members of The Council of Canadians Hamilton chapter celebrate at Hamilton City Hall after City Council voted to accept the Healthy Food and Beverage Action Plan that will see sales of sugary drinks and bottled water drastically reduced in city recreation facilities. The Peterborough-Kawarthas chapter and allies recently took to a busy intersection to make their 'Stop Kinder Morgan' message.